Coach Kathy participated in an episode of The Peoples Pharmacy Podcast. 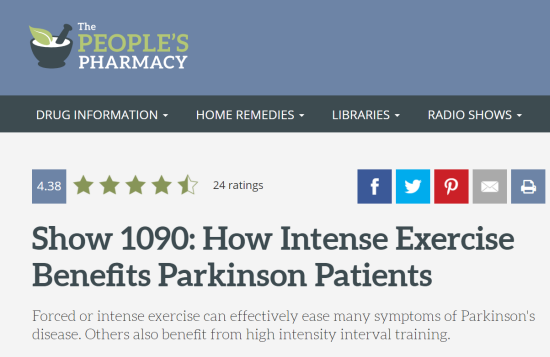 Forced or intense exercise can effectively ease many symptoms of Parkinson’s disease. Others also benefit from high intensity interval training. Kathy’s segment follows an interview they did with Dr. Jay Alberts. Ready to become a Parkinson’s Cycling Coach? If you meet our prerequisites – we’d love to have you join our army of Parkinson’s Cycling Coaches. This online 0.5 ACE CEC course costs $129.00 and will take apx five hours to complete. Here’s a great opportunity for Indoor Cycling Instructors and Studio Owners to attract and serve a new demographic of riders – active seniors! With over 12 MILLION members and 13,000 locations, SilverSneakers is a kind of quiet giant in the fitness industry. Participating senior citizens, across America, can take advantage of free access to health clubs and wellness centers that’s paid through their health insurance. The SilverSneakers FLEX program is designed for individual Fitness Instructors wanting to offer classes and activities at non-traditional locations. I’ve never stopped to ask, but I’ll bet the large group of seniors we pass exercising in a local park on our Sunday AM bike ride is a FLEX class. FLEX could be the perfect way to add some additional classes to your studio’s schedule. Our FLEX approved Parkinson’s Cycling classes are best conducted between 10:00 and noon. Seniors tend to eat dinner early (join us for the 4:30 blue plate special) so they might be open to a Senior Cycling class around 3:00pm. Interested in becoming a Parkinson’s Cycling Coach? Silver Sneakers has approved our Parkinson’s Cycling Classes! Kathy Helmuth and I have just received confirmation that our ACE approved Parkinson’s Indoor Cycling Coaching program has been accepted by the SilverSneakers organization! Now facilities that partner with Silver Sneakers will receive reimbursement for hosting classes. Individual Instructors at small Indoor Cycling studios can join the Sliver Sneaker’s FLEX program – You can learn more about the FLEX Instructor Program here. Parkinson’s Cycling – How do we “know” who is right for our classes? We want to help everyone? Right? Can we? Should we? I wish I could give you a checklist that you could follow for everyone of the participants who will want to take your cycling classes. It really is not that easy. This is a unique type of class, that is individualized and personalized for each of the individuals. That is what makes the Parkinson’s Cycling Coach training is so important. In our cycling coach training, we talk about the different stages of Parkinson’s disease. Just to remind you, there are 5 stages. At a quick glance, it would easy to point to Stage 1 and 2 as being the perfect participant. But, from my experience I have found Stages 1-3 to fluctuate. They ebb and flow between each other. After being categorized by a neurologist into one of the 5 stages we must remember that people with Parkinson’s have good and bad days. Don’t we all? The abilities of each day depend on how their medications are working that day. Did they sleep well, did they eat well, are they well hydrated? Are they stressed by other factors? Are they exercising consistently? So what does make a good participant? Let’s let go of the Stages of Parkinson’s disease for a moment. Your participants will have mild to moderate symptoms of this disease. This means that movements of daily lives can be challenging but the disease is somewhat to well controlled through medication. Sometimes only one side of the body is affected but occasionally both sides of the body are involved. Regular exercise seems to help most of these individuals. Now, let’s confuse the matter. Please do not dismiss someone with a walking aid. 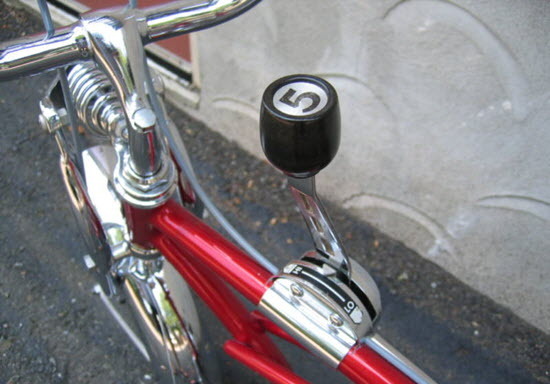 This stage is categorized as Stage 4. My experience as a coach has shown that some of these individuals who begin this cycling protocol have progressed so much that they no longer need that walking aid to come to class. You can and will make a significant difference in the lives of these individuals. Remember, as coaches we need to be focused on the goal as well as the participant. We want these individuals to reap the benefits of the program with the correct cadence and heart rate parameters. But isn’t the social aspect important too? The blend of all of these factors is the perfect scenario for success. It can and does happen frequently. We’re growing our army of Parkinson’s Cycling Coaches – if you would like to join us please review our qualifications. Parkinson’s Indoor Cycling Class – Music Therapy at CoxHealth Fitness Centers Springfield, Mo. Parkinson’s Cycling Coach (and ICI/PRO member) Sheryl DeBoer is offering classes at the CoxHealth Fitness Centers in Springfield, Mo. She shared this short video with me showing how they are using music therapy as part of their parkinson’s Cycling Classes. I am excited to see what new information this will provide. I am working with a music therapist in my Parkinson’s class. He is also on the Parkinson’s Board in our Springfield area. 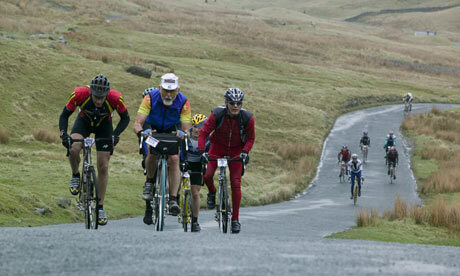 We have been offering Parkinson’s Cycling for several months now . It has been a pleasure as well as a challenge to work with this very special group. I have signed up for this certification because I am always interested in what other people are doing and also to improve my program if possible. It was quite a challenge to get this class offered but well worth the effort. Anyone from our community can participate in Parkinson’s Cycling at our fitness center without charge. Our local Parkinson’s Board is paying for the expenses of the class. Right now we offer one a week for 8 week sessions. I am emailing a video to you of my beta participant, Michael. He has very advanced Parkinson’s. This is the video we used to present our class ideas to the Parkinson’s Board. We now have a class one time a week. Inner Drive Cycling|Fitness Studio will be offering Parkinson’s Cycling Classes starting Tuesday November 11th. 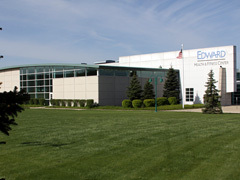 We’re very excited to announce our first, official Parkinson’s Cycling™ location at the Edward Health & Fitness Center – Seven Bridges in Woodridge, IL. You can download their promotional flyer here. The 10 week program offers 60 minute Indoor Cycling classes on Tuesday and Thursday from 10:00 – 11:00am. The first class is Tuesday Oct 7th and classes run through December 18th. Lead by veteran Parkinson’s expert, Connie Truesdale, participants will perform a RPM (rotations per minute) assessment then gradually progress to achieve the 80-90 RPM’s required. Operate at your own performance level while you reap the benefits of increased energy and control to improve everyday life activities. At this time, you should be progressing through your program, developing trust and rapport with each and every rider. Your riders might be seeing some of the benefits from the Parkinson’s Cycling Program. This profile will build on the short efforts of previous rides. The total working intervals will be extended to about 18 minutes utilizing short efforts with equal recoveries done on a seated flat. I am so glad that we have this opportunity to talk about how to coach and build the profiles which will help create your successful program. As I was writing this profile, I remember how eager but slightly anxious I was as I taught my first cycling class. I had the qualifications to teach the class as you will have, but this shiny new opportunity can create some feelings of hesitancy and caution. Those feelings of hesitancy and caution will be alleviated by reviewing and coaching this profile. The following profile provides the basics to coaches for the first 3 weeks of the Parkinson’s Cycling Program. Your riders will ride short intervals on a seated flat followed by equal recoveries.